This Valentine’s Surf and Turf Filet Mignon and Lobster recipe shop has been compensated by Collective Bias, Inc. and its advertiser. All opinions are mine alone. #MyTFMValentine #TheFreshMarket #CollectiveBias. This content is intended for readers who are 21 and over. 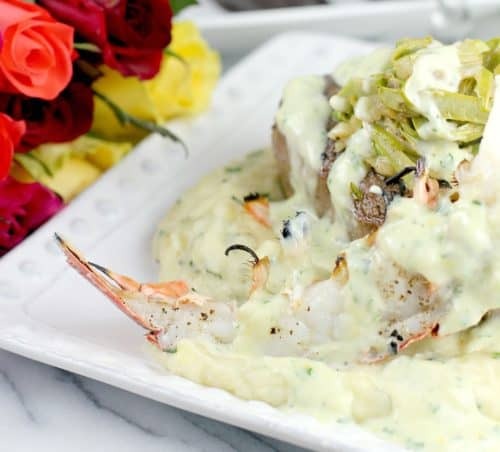 Creamy Horseradish Mashed Potatoes topped with a perfectly cooked filet mignon and Northern Atlantic lobster tail, topped with Moscato Asparagus Slaw, and buttery Lemon Cream. This exceptional Valentine’s Surf and Turf Filet Mignon and Lobster dinner is a perfect way to let your partner know how truly special they are. 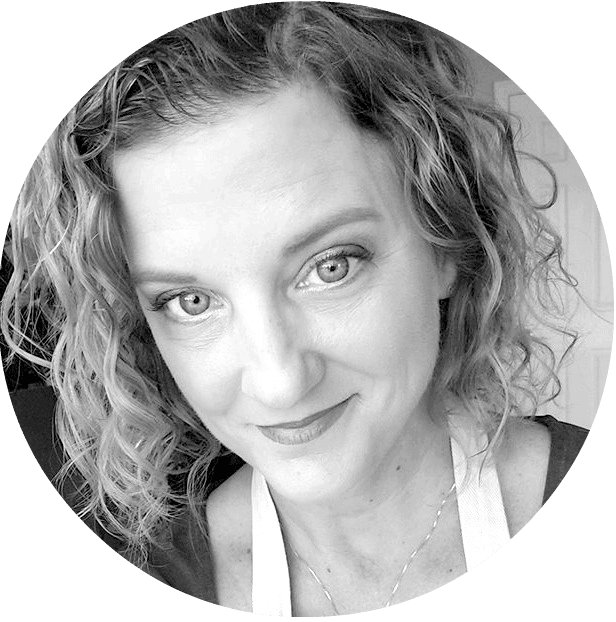 This post is a little different – and very cool – because I am not working with a product, I am working with a store, The Fresh Market! If you haven’t visited The Fresh Market yet, you need to. I love it – there is one across the street from my gym, so I have stopped in there countless times to grab things for a quick dinner. From seasonally fresh produce to exceptional meat and seafood, signature baked goods and carefully curated organics, all the foods you love are at The Fresh Market. My favorite is their deli section – they have delicious pasta salads and such. They also have deals each week on “meal kits” where for a resonable price, you pick up everything you need to prepare a yummy, easy family dinner. Love it. Orders for this meal kit will be available until February 11th, then pick-up is February 12th to 14th. And given the meal that came together for me using this kit, lemme-tell-youuuu this is SO delicious. 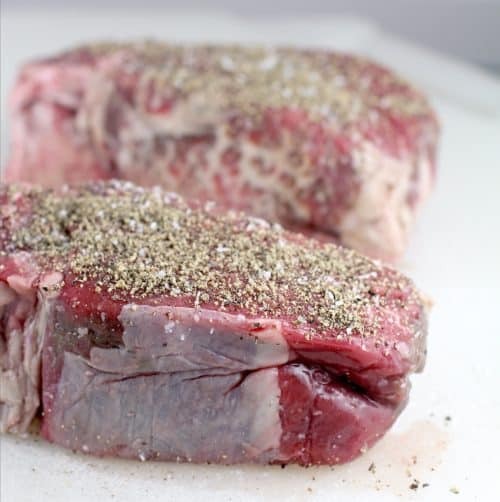 The filet are Premium Choice Chateaubriand Cut Filet Mignon, carefully selected from the center of the tenderloin roast where it is the most tender and flavorful., ensuring tenderness and the best flavor. The lobster tail meat is delicately sweet like you expect good lobster to be. The Yukon Gold Whipped Mashed Potatoes are made with just cream, butter, and potatoes. They come pre-cooked and everything, so you don’t have to do anything to them like I did for this recipe, just re-heat it that’s what you want. And dark chocolate-dipped strawberries YUMMM. And then the roses come in so many colors! I picked an especially vibrant mix and they are gorgeous. 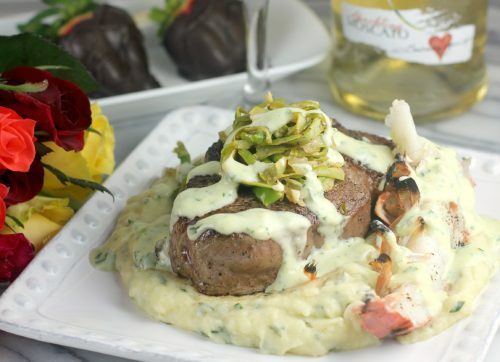 OK, so my fancy fancy Valentine’s Surf and Turf Filet Mignon and Lobster recipe. First, I put my own twist on the Yukon Gold Whipped Mashed Potatoes but adding chives, horseradish, and more cream. These potatoes ALONE are worth trying, trust me. Then I made a “slaw” – not really, but I don’t know what else to call it – with the asparagus where I used a vegetable peeler to make long asparagus “shreds”, then I made them awesomer with shallot, and a little garlic (just a little, this is for Valentine’s afterall), and MOSCATO. I TOTALLY didn’t plan on this twist – I had picked up the Salvatore Principe Sparkling Moscato, was enjoying a glass while cooking, and it hit me to add it to the asparagus. This Asparagus was AMAZING. A perfect topper for anything fancy. 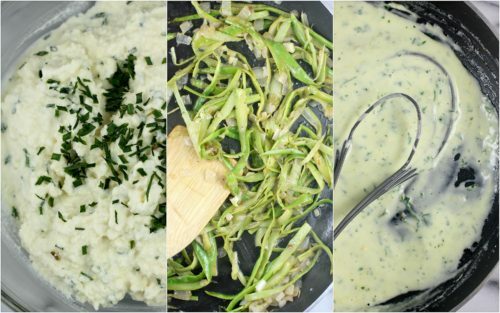 Then I made a easy and RICH Lemon Cream sauce to top it all – butter, cream, herb, parmesan cheese, a lemony hint from zest – ooohhhhhhh yass. This is good stuff. By this point, this Valentine’s Surf and Turf Filet Mignon and Lobster dinner probably sounds like so much work, but it honestly wasn’t. Everything here – every component – is completely quick-cook. Like, REAL quick. So once we prep, then we just bang bang bang it out and Voila! Anyway, continuing on to the protein. I wanted surf AND turf. So I got filet and lobster. BUT this recipe would COMPLETELY work with either or – filet mignon OR lobster. Brilliant? I cooked the filet the only way I think filet should be cooked. I normally grill all steak, but filet is from the tenderloin – so, it is tender but not fatty. I think the grill makes it tough. So I sear it stove-top, finish in the oven, and it is always just right for me. Then, for the lobster, I just broiled it for a minute. See? Quick. Cook. 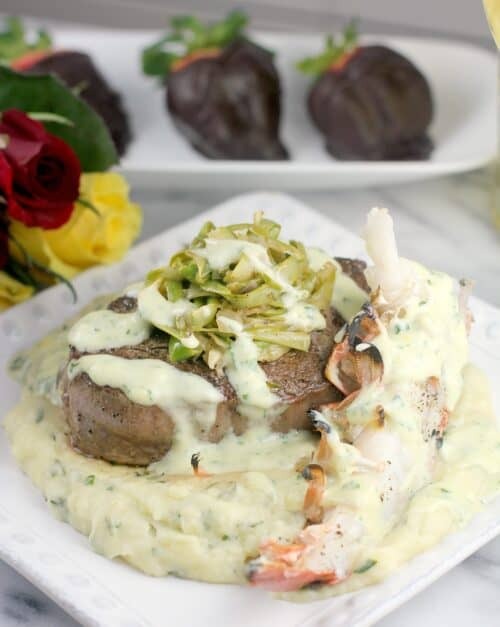 One last note to show how easy this Valentine’s Surf and Turf Filet Mignon and Lobster is – I prepped the potatoes, then heated in the microwave for just 3 minutes. The asparagus only took a couple minutes. Then I cooked the Lemon Cream WHILE the steaks were in the oven, and I cooked the lobster while the steaks were resting. So the total cook time is ~15 minutes, give or take. The key to keeping this easy is to assemble all the ingredients and get organized while the oven is heating. That is all it takes. So, that’s it folks. A great deal from The Fresh Market to give you a romantic dinner, and my recipe for a fabulous way to prepare it. Nothing says love like cooking someone a special meal, and this Valentine’s Surf and Turf Filet Mignon and Lobster dinner will do that for you. 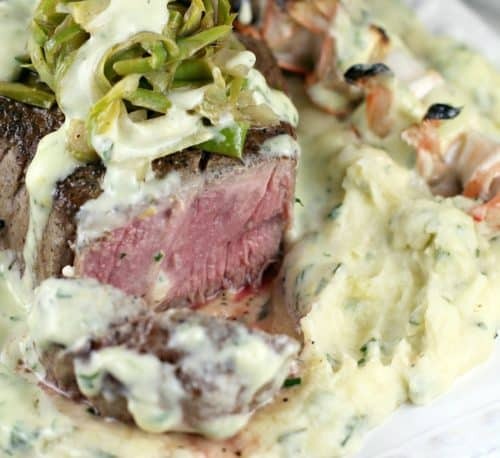 Creamy Horseradish Mashed Potatoes topped with a perfectly cooked filet and Northern Atlantic lobster tail, topped with Moscato Asparagus Slaw, and buttery Lemon Cream. Combine the ingredients for the potatoes in a microwave-safe bowl and set aside. Heat a medium, nonstick skillet on high heat. Add the butter, shallot, and garlic and saute until fragrant. Add the asparagus and wine, and cook, stirring often, until liquid is mostly evaporated. Season with a pinch of salt. Set aside. Season the filet with kosher salts. Season generously with fresh cracked pepper. Heat a skillet, preferably cast iron, on high heat. Add the butter. Once butter is melted and hot, add the steaks. Sear the first side well. Flip filets to sear the other side. Put the skillet into the oven and cook to desired doneness, 6-8 minutes for rare to medium-rare. Remove from the oven and set aside to rest 5 minutes. While the filets are cooking in the oven, heat a medium, nonstick skillet over high heat. Add the butter and cream and simmer a minute or two until slightly thickened. Add the cheese, lemon zest, and parsley and cook until cheese is melted and cream is thickened. 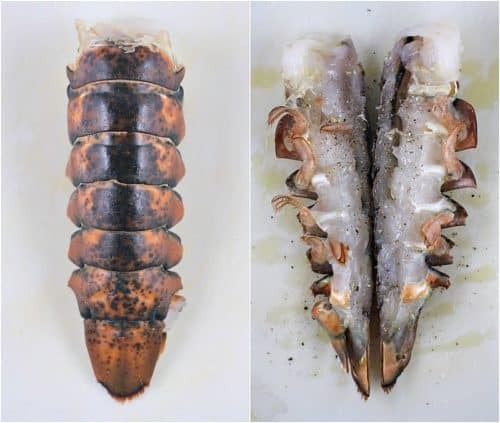 While the steaks are resting, split the lobster tail with a large chefs knife. Put the split tail on a bake sheet. Drizzle with olive oil and season LIGHTLY with salt and pepper. Broil for 1-2 minutes until meat is cooked through. Also, while the steak is resting, microwave the potatoes ~3 minutes or until heated through. On a plate, layer Horseradish Mashed Potatoes. Top with filet mignon and a half lobster tail. 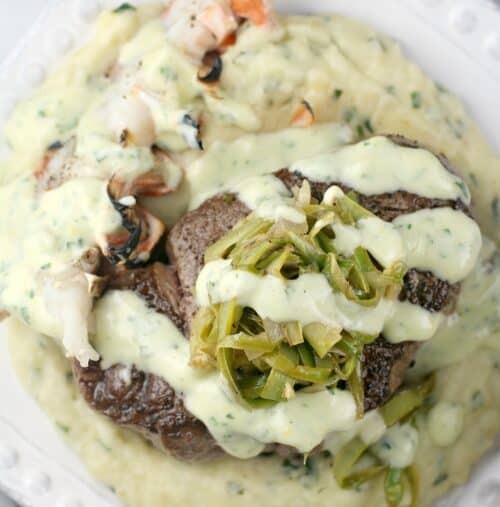 Top the filet with Moscato Asparagus Slaw, then drizzle Lemon Cream lightly over all the dish. Yields: 2 servings. I am specifying regular cream because I do not mean whipping or heavy cream. For the filet, the Chateaubriand cut filet mignon are thick enough that you can get 1 filet and 1 lobster tail in The Fresh Market kit, then cut the filet horizontally to make 2 portions and proceed. However, if you want two full filet steaks, then get those in the kit and add the lobster tail extra. For more Valentine’s Day inspiration, visit the social hub. Visit here for a store locator. And leave me a comment! 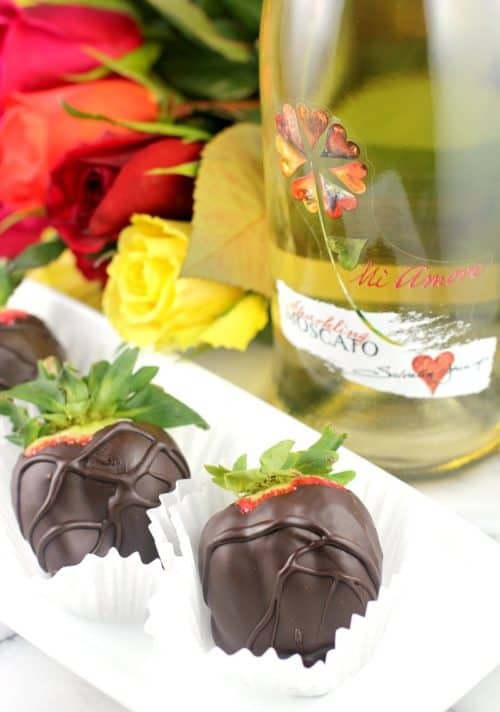 What is your romantic dinner going to be this year?